As posted below, the OIPA has a new call to their membership to fund a campaign to make sure they keep the “special 2% “ rate on new wells. They say they want to raise money to put a new face on the industry! They’ve put a ” new” face of the industry in Oklahoma alright – one of destruction of property and greed. It is disheartening to see so much of the work so many of us have done over the last 30 years to improve our relationship with the Oklahoma public goes down the drain so fast. The OIPA we belonged to put our state’s interest at least on par with our own. Setting the priority of protecting a 2% tax rate that is so obviously low, especially in light of our states serious budget deficits, simply is an indefensible position – even more so when considering that the historical rate of 7% is lower than in any other horizontal drilling state in the US. Our industry should lead by example, relinquish the special 2% rate, and ask that other tax give always be abolished as well. Government should stick to funding it’s core functions. The marketplace should pick winners and losers in business. 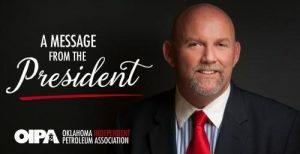 Oil and gas industry Leadership should put civic responsibility ahead of our own special interest, especially when we have become a big part of our funding problems by getting the legislature to approve the lowest -in – the-nation- Gross Production tax at the expense of our children, our state’s infrastructure, healthcare, and safety net. Join with us at the Oklahoma Energy Producers Alliance ( okenergyproducers.org). Let’s put on “our Oklahoma hat” and lead by example, return our state to fiscal sanity and start by restoring the Gross Production Tax from 2% on new wells to the historical rate of 7% that 86% of producers and royalty owners already pay. Only then will our states largest industry have the moral standing required of civic leadership. In the past week, I’ve had the privilege to meet with Oklahoma’s legislative leadership to discuss current trends in the state’s oil and natural gas industry as well as the upcoming 2018 legislative session AND the potential special session this fall. With the Oklahoma Supreme Court rejecting the 2017 tobacco “fee,” it’s becoming clear that there will likely be a special session sometime this fall to deal with the budget shortfall. The court has yet to rule on the excise tax issue, but if they rule it as unconstitutional, the budget hole will be even greater. What does this mean? Once again there will be cries to raise the gross production tax on oil and natural gas development. Our legislative team fought all session long to protect our drilling tax incentive on new wells which places the incentive rate at 2 percent for three years. After the three years, these wells go to 7 percent. This tax incentive has helped Oklahoma companies stay competitive and attract additional capital investment. In recent weeks, you should have received your membership renewal invoice for the 2017-18 year. I respectfully request that you consider continuing your generous support of OIPA’s efforts to protect you and your business. I would also like you to consider an additional commitment for a new and aggressive public education campaign that will help put a “face” on our great industry. Your OIPA team works hard every single day to ensure that the interests of our great industry are protected and promoted among policy makers at both the state and federal level. The more resources we have – the more effective we can be for you! This past spring, OIPA led the way to pass historic legislation to allow for long lateral drilling. This will lead to incredible investment in Oklahoma production. We also led the way in protecting your gross production tax rate to incentivize new drilling in Oklahoma. There is no other group in Oklahoma that represents the oil and natural gas industry better than OIPA. We like to call ourselves THE ASSOCIATION! So please consider completing your membership renewal and send it in so that we can continue to fight for you. If you can add an additional amount to your membership dues, your efforts and commitment will be greatly appreciated. I deeply appreciate your support of our efforts and we look forward to another great year in your service. Hydraulic Fracturing It’s Not Fake News. It’s Just Not Quite Accurate News.